In which writewyattuk runs the rule over three recent publications offering a creative twist on established children’s fiction – with great success. 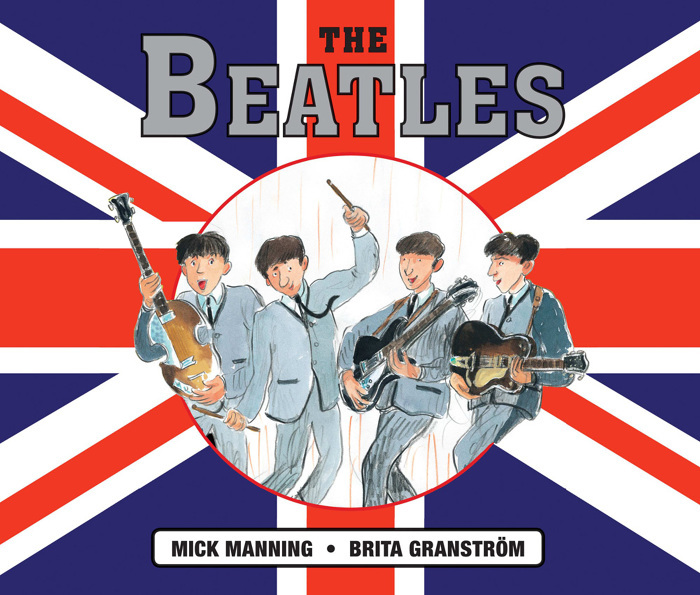 Back in my school days, I’d have loved poring over books of the quality of Mick Manning and Brita Granstrom’s The Beatles (Frances Lincoln, 2014). Come to think of it, that’s still the case today. Age ought not be a barrier when it comes to great reading. 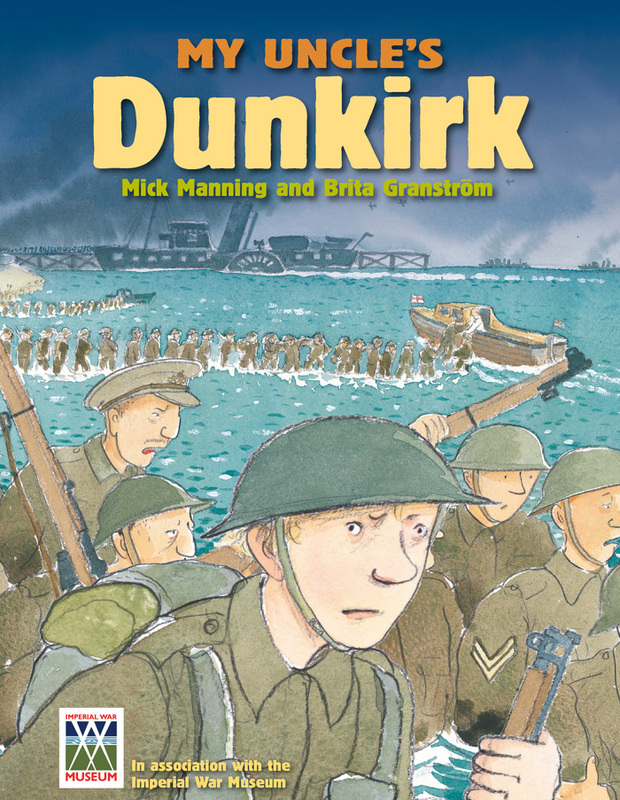 I loved the same authors’ My Uncle’s Dunkirk, and further Second World War themed biographical picture books, Tail-End Charlie and Taff in the WAAF, re-telling Mick’s parents’ war-time tales. In all three cases, Mick’s simple but honest narrative is perfectly complemented by a visual poignancy created by Swedish-born illustrator Brita. And now we have their latest offering, moving on to the 1960s to tell the story of The Beatles in that same stimulating picture book biog format. There’s a thin line between entertainment and education, and it’s a tricky one to negotiate, but somehow Mick and Brita manage it every time. I know the Fab Four story pretty well – as will many of us ‘older’ readers – yet all the same I was impressed by just what was covered, even finding a few surprises. I tend to get a bit precious when it comes to anyone man-handling my pristine copy of 2000’s The Beatles Anthology, but this tells the tale in more child-accessible fashion. It’s a perfect introduction to this Liverpool four-piece, and I could easily see the younger me dipping in and out of its pages, then seeking out the records and trying to find out more. Sgt. Pepper’s Lonely Hearts Club Band had only been in the shops five months when I was born, but I grew up loving everything John, Paul, George and Ringo related. So this would have fitted the bill perfectly. It could so easily have been a Beatles-by-numbers style half-arsed tome, but Mick and Brita have far more about them than that. The fact that band historian Colin Hall played a part tells us a little too. In short, it’s well researched, visually intriguing, and even if there are – inevitably – parts of the story I’d rather have seen covered, it’s all more or less there. From the band’s post-war Merseyside roots through to their split at the turn of the ’70s, it’s an absorbing story condensed pretty well into 48 or so picture-led pages. Like My Uncle’s War, there are moving moments too, not least the shot of Paul with his arm around his dad after his mum’s death, and one of John in similarly sad circumstances. From the Quarrymen days, George’s top-deck audition and Ringo’s introduction at Pete Best’s expense onwards, it’s a wonderful account. Right through to the Get Back rooftop finale, all the big moments are there, not least Stu’s remodelling via Astrid, Brian Epstein’s Cavern epiphany, George Martin’s studio ponderings on this cheeky quartet, the band’s big US break, and the film years. A few of the songs get more in-depth treatment, including the tales behind Yesterday, Lady Madonna, Strawberry Fields, Ob-La Di Ob-La Da, and Octopus’s Garden. From a personal point of view, I was pleasantly surprised to see as much coverage of the wondrous Revolver as the over-hyped Sgt. Pepper. There’s also a look at where the individual members went from there, and a timeline charting the band’s progress against wider achievements in that amazing decade of social revolution. 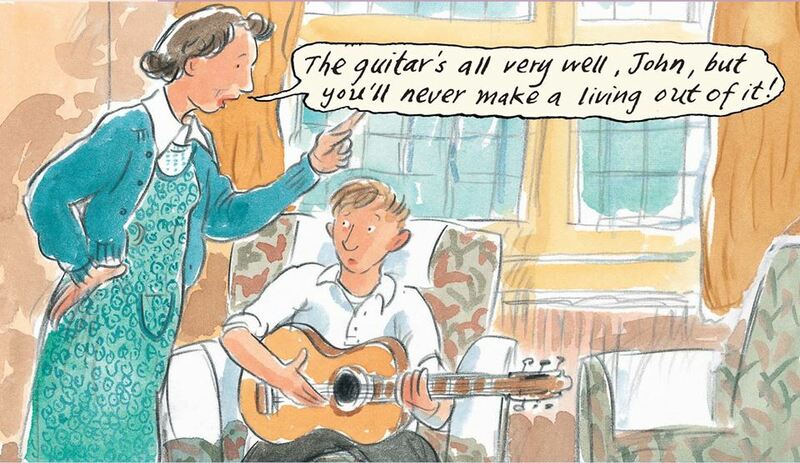 All in all, Mick and Brita capture the story through that heady mix of artwork and frugal prose, including the humour of this great band. There are incidents described where they must have struggled with the wording in a children’s book. But nothing’s been swept under the carpet. And if they only tell half the story in places, younger readers should still get the subtle inferences and find out the rest for themselves. This will never be – by definition – an authoritative work on the Fab Four, but it’s a fantastic starting point to the band and those special times. The captioned illustrations also suggest stylish shades of a favourite cartoonist from my NME and Punch reading days, the late Ray Lowry, who dealt with that same period so well. In the wider sense, Mick and Brita‘s approach to non-fiction continues to impress, and they offer a window on to this 1960s phenomenon here – telling the story of a group just as relevant in modern culture all these years on. 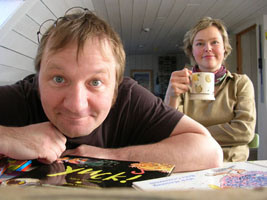 To learn more about Mick Manning and Brita Granstrom, head to their website here. Bali Rai’s Old Dog New Tricks (Barrington Stoke, 2014) is in certain respects a more conventional tale. It follows 15-year-old Harvey as he gets to know his new neighbourhood, including Mick, the bad-tempered racist next door. Harvey is a likeable lad from a Punjabi family, deep at times but always dependable, and determined to follow his Dad’s example in this Leicester-based story – seeing the best in everyone, even when all evidence is apparently to the contrary. In so doing, he tries to look beyond Mick’s gruff, rude exterior, trying to understand just what makes this ‘old man’ tick. What sets his curiosity in motion is the sense that despite his outspoken, dodgy views, Mick seems to dote on his mangy old mongrel, Nelson, albeit with a questionable care regime. And with Harvey set on owning a dog himself, he sees a way he might be able to bond with Mick and help look after his loveable mutt. Harvey reckons Mick can’t all be bad in his choice of music too, hearing through the walls the blaring sound of bands his Dad introduced him to, like The Beat and The Specials, as well as Bob Marley and Jimi Hendrix – a taste seemingly flying in the face of all those dubious right-wing tendencies. As the story develops, Harvey happens to be around – with his new girlfriend in tow – as Mick is taken ill, and helps get him to hospital, using his opportunity to try and find out more about him. There’s more to the story of course, and in the wider sense Bali’s tale is about far more than doing the right thing amid blatant racism and bullying issues. There are wider themes of friendship and fitting in too, as well as an underlying love story. We’re also offered a subtle portrait of life among Britain’s multi-cultural communities, and Sikhism today. 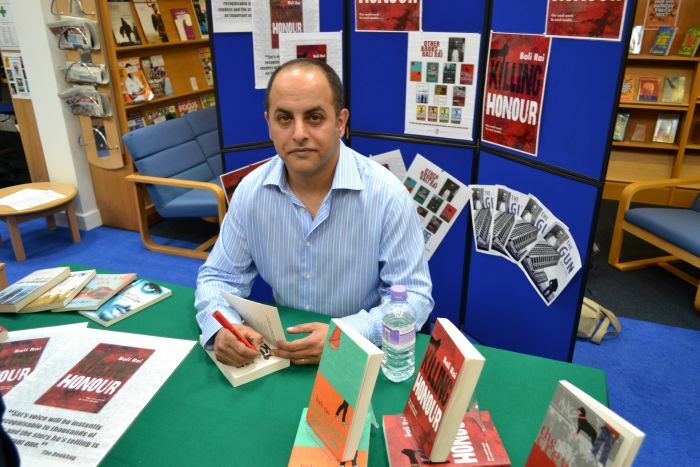 And we’re in good hands with Bali, who’s already proved his worth with past works like Rani and Sukh – on the GCSE English set-text list – and North East Teen Book Award-winner Killing Honour. This 82-page read is all the more powerful for its seemingly simple style, nicely crafted by the author to help entice more reluctant readers and keep them gripped. Yes, there are moral lessons here, but there’s nothing ‘in your face’ or patronising about Bali’s style. And for that he deserves high praise. There’s another aspect too. It’s a ‘dyslexia friendly’ read, the book’s publisher having more than 15 years’ experience working with dyslexic readers aged eight and up. 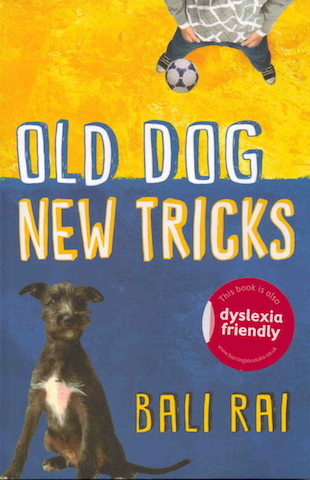 Books in this same series – from a number of acclaimed children’s writers – include a raft of accessibility features to open up the love of the written word to young people with dyslexia and other issues, or those simply daunted by ‘big books’. 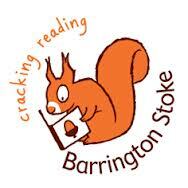 For more information about Barrington Stoke, how it aims to help dyslexic readers, and more of its recent releases, head to www.barringtonstoke.co.uk. And to learn more about Bali Rai, his books and events, head to his website here. Finally, I’ll wax lyrical about a book covering similar territory. OK, so it’s been around a while, but I’d argue that it often takes a while to stumble across some of the better examples of great fiction – and that’s definitely the case with me on this one. Sarah Crossan’s The Weight of Water (Bloomsbury, 2012) was recommended to me by my 14-year-old daughter, and has won many admirers since publication. Like Bali, Sarah offers a vision of 21st century multi-cultural Britain, with her story set less than 30 miles down the road from Leicester. While it concerns Coventry, it could so easily be about Anytown, UK in this era of soapbox pontificating about foreigners and national identity. The issue of refugee arrivals is nothing new, yet Sarah offers a valuable, empathetic understanding of the immigrant experience. There are other factors too – as with Old Dog New Tricks – not least bullying and teenage pressures such as the need to fit in amid falling self-esteem. Our protagonist is Kasienka, the daughter of a lovelorn, abandoned Polish mum who has followed her ex to the land where he escaped to build a new life. Yes, I forgot to mention that. You see, this is no ordinary immigrant’s tale, but one written entirely in verse – and all the more absorbing for that, thanks to the author’s great skill with this artistic form. There’s a lot here about identity, as you’d expect from a story written from the viewpoint of a self-conscious teenage girl trying to make sense of her world. By way of example, she’s told by her fellow pupils that her hair’s the wrong length and is told she’s carrying the wrong bag – just the latest barriers to assimilation in this strange country. While her Mama still yearns for a happy reunion with Tata, it becomes increasingly clear to Kasienka, friendly neighbour Kanoro and us that it’s not likely to happen. If that’s the general thread of this story, the focus for Kasienka is how she adapts to a seemingly-uncaring school system and makes new friends. She clearly wants to conform, but in coming up against ‘popular’ classmate Clair, it becomes clear that she’ll have to fight to retain any degree of individuality. We find signs of her spirit of independence through her prowess in the swimming pool though, and her budding relationship with a lad she meets there. A lack of family funds rules out too many visits to the baths, but swimming becomes Kasienka’s main escape from problems at home and at school. She also gleans strength from her friendship with Kanoro, the mild-mannered hospital cleaner from the next flat. Kanoro, a practising doctor home in Kenya, is just another down-trodden immigrant in his adopted country. But he has a faith and belief that Mama seems to have lost. Like him, we find that Kasienka – despite her intelligence – has to prove herself in her studies before she can join children of her own age in the classroom. But Sarah’s strong narrative ensures we’re there at her side from the moment she arrives at Stansted, fresh from Gdansk. We also feel her pain, not least when she first surveys her new home, a dingy fourth-floor flat in a crumbling building just off Coventry’s ring-road. We get glimpses of Tata’s new life too, and snapshots of the family’s Polish past, as Mama struggles to adapt while her daughter resolutely clings to her own identity. The Weight of Water is a brilliantly-observed case study of casual racism and assumptions, bullying and peer pressure, friendships and families. Sarah’s economy of language allows the story to flow throughout, and what could so easily be a depressing tale is ultimately uplifting, while casting fresh light on the immigrant experience. 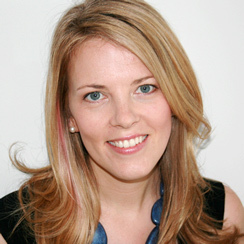 To learn more about Sarah Crossan and her publications, head to her website here. This entry was posted in Books Films, TV & Radio and tagged Bali Rai, Barrington Stoke, Bloomsbury, Brita Granstrom, Coventry, Frances Lincoln, Leicester, Mick Manning, My Uncle's Dunkirk, Old Dog New Tricks, Ray Lowry, Sarah Crossan, The Beatles, The Weight of Water. Bookmark the permalink.